Many of today’s back problems aren’t caused by “bad backs”. Instead, they are a result of years and years of bad habits. We slouch when we sit and hunch when we walk. Some people jut their hips forward, others push their derrieres out. You may not even realize how bad your posture is. But the truth is, a lot of people simply don’t know how to stand and sit up straight anymore. This places a huge burden on your spine, and can eventually lead to permanent physical changes. At some point – if not already – you’ll start experiencing painful problems with your discs, vertebrae, spinal muscles and joints. And once these problems start to kick in on a regular basis, they can be very difficult to treat. This is why I recommend that you start developing healthy back practices right now. It’s the one, single thing you can do to save yourself from years of disability due to chronic and debilitating back pain. When it comes to your back, developing core muscle strength is an absolute must. Certain exercises, like bridges and planks are great on this score. However, no amount of exercise can make you stand up straight. It can only build the musculature that helps supports your back when you physically make the effort to stand and sit at full posture. So let’s take a look at a quick, daily exercise that – with the approval of your doctor – not only helps you gauge your posture, but also helps you improve it. Step 1: Stand with your back against a solid wall. Place your feet about six inches from the wall and slightly bend your knees. Now, before we continue, let me make an important observation. Your ability to perform this exercise depends on the state of your back. If structural changes prevent you from pressing your buttocks, entire spine and shoulders against the wall, it’s a good idea to start off performing this as a floor exercise. All of the same instructions apply. You just perform it while lying down. Step 3: Place your arms straight out to each side, palms facing forward. Then, bend your elbows at a 90 degree angle. (You’ll look like a goal post). Step 4: Tighten your abs and slide your arms upward while keep your head, shoulders and entire spine pressed against the wall or floor. Then, slide them down back down into goal post formation. Repeat four to five times. Remember to keep your chin tucked throughout the exercise. For best results, perform this exercise at least twice a day. When you finish it, you’ll find that you stand much straighter and taller. This is because it helps to flatten out the curves caused by too much slouching, hunching and other bad habits while also helping to separate vertebrae and stretch muscle tissue. 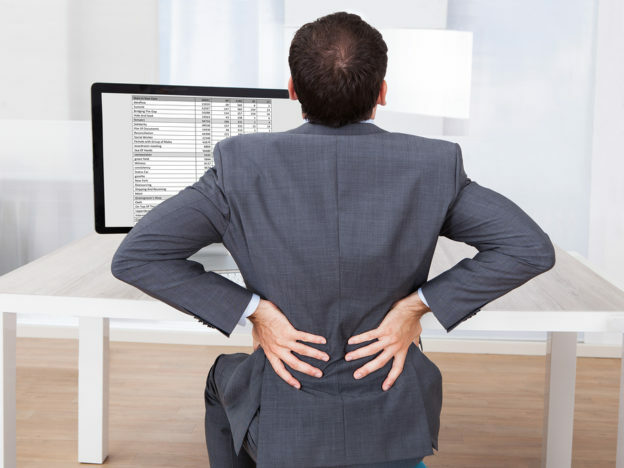 If you think about it, sitting may be one of your worst enemies when it comes to your back. This is especially true in these days of computers and smartphones. People often hunch over with their heads jutting forward while working on these devices. If you’re one of them, just imagine what your posture will look like in the next decade or two! So here’s the thing. From a side view your ears, shoulders and hips should all be in alignment. This is true whether you are sitting or standing, so it’s a good image to keep in mind throughout the day. But when you’re at work on your computer or involved in smartphone activities, it’s easy to forget to think about your posture. And if you’re common default is to hunch, you may find yourself slumping down within a matter of minutes… without even noticing it. This makes it a great idea to take frequent breaks. You can stand up and walk around. Maybe even sneak in a few minutes to perform the exercise I mentioned earlier. Sit tall with your hips, shoulders and ears in full alignment and your feet flat on the floor. Let your arms hang easily at your sides. Roll one shoulder forward, up and then backward toward your spine. Then do the same with the other. Tuck your chin down, lengthen your neck and reach your arms toward the ground for about five or ten seconds. Doing this every 30 minutes or so will help smooth out hunched and stooped shoulders, stretch your spine and help you maintain better sitting posture throughout the day. Remember. When it comes to spinal health, back pain and back-related disability, posture and core strength are everything. But one doesn’t work without the other. Do your planks. Do your bridges. Then stand tall and sit straight! This entry was posted in Joint Health and tagged how to do angel exercises, how to improve posture, how to stand tall, how to stand up straight, how to straighten my back, posture and back pain, posture exercises, what can I do to stop hunching my shoulders, what causes back pain, why does my back always hurt on March 28, 2018 by Taylor Donnini.